Sharing our stories one to one. Sometimes less is more. Sometimes we forget to look up, so weighed down are we by the clutter of our daily lives, preoccupied with the screens in front of us, or the pressing problems we feel will never be resolved, so ridden with fruitless fretting and frowning that we forget to raise our heads and see the bigger picture. One day before Christmas, a day when I was neglecting to look up, above, and beyond the banal and trivial, I opened my mailbox to find a hand-written envelope addressed to me. It was from my friend Suzette. She had just read my book, Changing Lightbulbs, and had felt compelled to put pen to paper, not just because of the part where I mourn the dying art of letter writing but also because of the striking similarities between us. She has a way with words. Her letter moved me to the core. If I hadn’t ventured, on my own and somewhat nervously, to a Writer’s Festival event several years ago, and looked around me, I would never have met Suzette. I could have sat there self-consciously in the audience, staring at my phone, pretending I had important messages to send and receive, looking busy, biding time before the talk began. But something made me look around, and there she was, a dark-haired woman with an open, friendly face sitting a couple of rows behind me. We made eye contact, we said hello, we moved to sit together and we became friends. We haven’t known each other very long, we don’t know each other well, but we have a unique connection. In her letter Suzette wrote about how much we have in common, the parallels in our lives and families, our taste in music, film and books, our pet hates, our concerns about the society we live in, our love of nature and musical theatre, the things that really matter to us, our belief in the sublime and the spiritual, our sense of awe about the mysteries of life and the universe. She wrote about how fortuitous our meeting had been and how glad she was that we’d met. What a beautiful gift this letter was. Another reader recently sent me a message to which she attached photographs of a nine page handwritten letter she had just penned in response to my book. She had also seen parallels in our lives. In her letter she opened her heart in the most wonderful way, sharing part of her story, telling me of her childhood, revealing some of her innermost thoughts and the challenges she has had to face. It was a timely reminder that we are never alone and that we are all bound together by our common humanity. My mother and grandmother, separated by the Irish Sea after my parents’ marriage, used to write to each other regularly. Every week, until my grandmother’s health began to fail, a crisp blue or white envelope would land on the mat in the hall, the Queen serenely silhouetted in the top right-hand corner. I was also once a prolific letter writer to my parents and family, to friends and boyfriends throughout school and university and into my working life. Some of the letters I received are stored carefully in shoeboxes, and occasionally I feel the urge to read them again. Each time I’m brought to tears by the familiar handwriting of my now deceased parents, or the increasingly shaky, spindly script of my maternal grandmother, or the hopes, dreams and aspirations of the teenage and young adult versions of my friends and me, by the break-ups and make-ups and travelling tales. By the zest and exuberance of youth at a time when the future stretched luxuriously before us, to infinity and beyond. I replied to Suzette (and to my other correspondent, albeit using more contemporary channels). I confess that I typed the letter, not wanting to subject her to pages of my sometimes indecipherable (even to myself) handwriting, a decision vindicated by her comment that the few words written in my own script reminded me of her doctor’s scrawl. I printed my letter, put it in an envelope, wrote the address as neatly as I could, walked to the post office, bought a stamp, licked it, put it on the envelope and popped the letter in a big red letter box. It was immensely satisfying. Meaningful and satisfying. How wonderfully life-enhancing it is to tell stories and share experiences. And what a joy it is to write and receive letters. 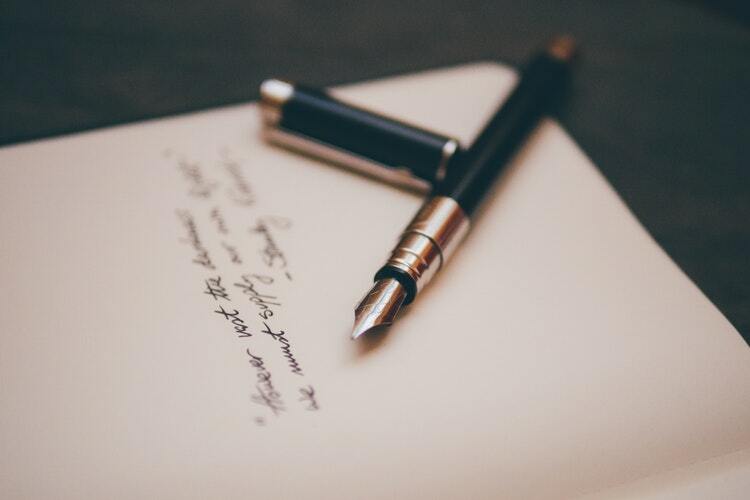 We can share online as often and as much as we like, and an amazing thing it is, but the intimacy of a hand-written letter, from one person to another, for that person’s eyes only, creates a unique bond that can never be emulated through social media. So, on the cusp of a New Year, why not take the time, now and again, to write down your thoughts and share them one to one, as well as one to hundreds, thousands, millions. Sometimes, less is more.